Halloween parties, tricks and treats, and goblins both big and little on the roads: Halloween is one of the busiest nights of the year for pedestrians, and unfortunately, it’s also a busy night for Halloween drunk drivers. According to the National Highway Traffic Safety Administration (NHTSA), Halloween is one of the deadliest nights on the roads. 44% of fatal crashes on Halloween and the weekend prior to involve a drunk driver, and 23% of pedestrian deaths on Halloween night are due to someone making the choice to drink and drive. Those are scary statistics, but the good news is that, with a little preparation, you can protect yourself and the people you love this Halloween. Whether you’re out walking your little one for trick or treating or you’re heading out to a local party, any pedestrian on the roads this Halloween should be well aware of their surroundings at all times, stick to the sidewalks when walking, and stay in large groups if possible. You can also add reflective material to your clothing and carry a flashlight. Both will make you more visible to drivers on dark roads. If you plan on drinking this Halloween, the best thing you can do for yourself and everyone else on the roads with you is to find a sober driver before you go out. That way you’ll already have a ride home planned and you won’t be tempted to drive your own vehicle. If you spot a Halloween drunk driver, don’t hesitate: pick up the phone and dial 911 and provide police with as many details as possible. Before you host a Halloween party you should brush up on social host laws in your state. You may be liable for any underage drinkers at your party, and you can also be responsible for people who leave your home and drive under the influence. Do your part by collecting car keys and ensuring that no one under the legal drinking age has access to alcohol. 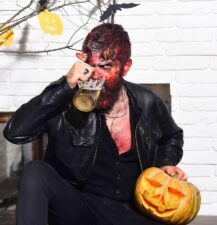 Halloween is supposed to be scary, and knowing the roads could be clogged with Halloween drunk drivers may be the scariest thing you experience this holiday. Follow these tips, stay safe, and you’ll have fun on the spookiest night of the year.